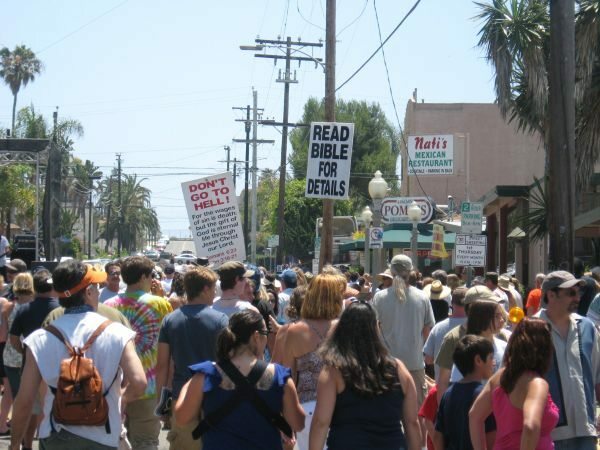 Practicing open air street preaching and evangelism at the OB Street Fair must be one tough gig. 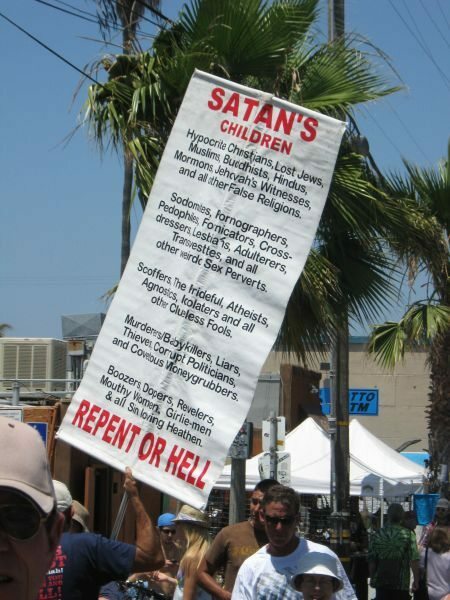 Let’s face it, Satan’s Children seemed to outnumber the Honest to God True Christians by about 69,000 to 35. But come on, how much creditable suffering points can be accrued when the lost souls come packaged in so much mortal youth and beauty, smiling tanned faces, and happy people peacefully enjoying a gorgeous day? I couldn’t help looking out across all those people in the streets, listening to the sounds and watching those bobbing signs without thinking about the carnage that has occurred these past weeks in the streets of Iran. I felt an overwhelming sadness for the people there and a deep gratitude that so far we’ve managed to hang on to our religious freedom, freedoms of association and speech, and the separation of Church and State. While our own civic discourse on these issues has been contentious, even rancorous, we aren’t Iran by a long shot. So I went up to one of the men holding a sign. (As an aside, this was a largely male gathering. I only saw a couple of kids and a woman.) He handed me a Get Out Of Hell Free card (www.preachtruth.org) and was ready to start preaching. I asked him to hold off a second and managed to ask “Don’t you think it’s really great that we can all be here right now and not have to agree with each other and nobody gets beat up or killed? He replied “that’s the kind of stuff that happens over there- Iran.” And then he was off and running, preachifyin’ and I walked away. And of course there’s the rub. Our free speech protection does not have fine print which excludes whack jobs and the angry and deeply disturbed at the most extreme, let alone the people with whom we really really disagree. And I say don’t mess with free speech. Period. On the other hand, we should be shaming the shamers and turning it right back on them. While I could care less about who someone personally and privately wants to take to lunch, or marry their kid, I would like my fellow citizens to feel that it doesn’t fly to air their Satan’s Children dirty laundry out in public. It’s a real stinker. Hey Anna! You’re totally right… Although it’s sometimes shocking to see this sort of scene in OB, it’s great that everyone’s copacetic enough to live and let live and not start a manly brawl over someone else’s views and how they don’t gibe with your own. I wish I went to the Street Fair, but I was just sorta tired and wanted to spend time with Frida the cat instead of being out and about on my feet and all that. Mouthy women?… This should end well. Did the sign mention ANYTHING about LOVE thy neighbor? of course you ALL have noticed that the OBRag’s staff includes “uppity women”. i wonder if that’s as “bad” as “mouthy women”? I wish people would stop practicing intolerance in the name of Jesus. It’s mostly the born again and fundamentalists that aren’t getting the true word of Love that he preached. I saw these signs too as they were there when Joey Harris’ band was doing their set. Joey had some fun with them though mostly at their expense but all in all it was pretty peaceful. As a true Christian and loyal American, I may not agree with what those signs said, but I will defend their right to say it. I’m not too sure if that street runs both ways though. So all women go to hell? I feel better now. Sounds like the whole town of OB is going to hell! That’ll make for a nice afterlife indeed. Do we need a seperate spot for these kooks like balboa park had on earth day? I think not, lets just smile and move on. It sure made for a fun day for Sacrilegious Dave. I talked to all 3 sign holders, invited them to Fridays OBC. Only one assured me I was going straight to hell. I thanked all 3 for some new material. I agree with Vance. Smile, chuckle, move on. I feel rather sorry for these poor guys. Lot’s of hate and discontent. That’s no way to live this all too short life. Abby, Dave(s), Anna and the rest, see you at the after(life) party! I’ll bring the beer. Do you think they’ll have ice? No ice, but do they have a great BBQ! I have a photo of the guys with the signs AND the AZ is in the background. Bad Science Fiction was playing at the time the group came down to parade around Chucks stage..it was very funny. Maybe they were sending a message to the group. I was standing outside a store waiting on my friends who were buying some flips and wow, I never thought I would hear someone utter something so insane, to this African American woman who was walking by talking with her friends…. This woman, bless her soul, ripped him a few new ones until someone working for the festival put a stop to it. I wanted to give him a few pieces of my mind, but I wanted a hotdog. That guy deserved a knuckle sandwich.